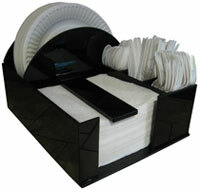 Paper plate storage dispenser made from 3/16 shiny black plastic. Picnic and buffet caddy for paper plates, napkins and cutlery. Organize paper plates, napkins, fork, spoons and knives in your kitchen and cabinets. Paper plate and napkin dispenser for BBQ's. 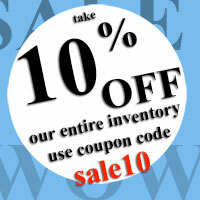 Works in restaurants, deli's, convenience stores, coffee shops and breakrooms. Tired of losing your BBQ disposable silverware? Napkins blowing all over the place? Worry no more, we have the perfect solution for you! Our paper plate and napkin holder keeps your picnic and BBQ needs - your paper plates, napkins, knives, forks and spoons- conveniently in one place. When you have guests, just take the whole unit out of your cabinet and place it on the table. Looks great and no clutter. Makes a great gift too! Hold up to 200 9” plates, up to 80 napkins 6.5” x 7”, 50 forks, 50 spoons and 75 knives. Total unit dimensions: 10” wide x 7.5” tall by 12.5” deep.